Last week’s post was about the first book in this futuristic series featuring famous fairy tale characters. This book, which is due to be published this February, stars none other than Red Riding Hood. Life on her quiet farm in a small French town never seemed out of the ordinary to Scarlet. 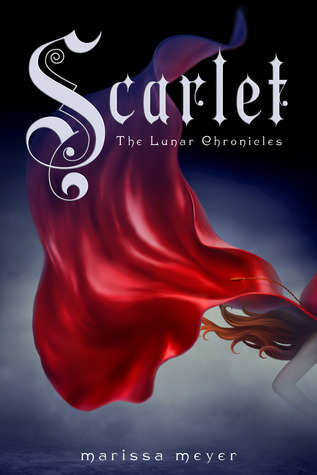 That is, until her grandmother mysteriously disappears and no one will help Scarlet find her. Throw in a dangerous, surly stranger that goes by the name of Wolf and the reappearance of her once charming but now deranged father and you can quickly see that her life will never be the same. Expect to see the return of some of your favorite characters from the first book, including Cinder herself. I won’t reveal too much here so I don’t give away anything important, but Marissa Meyer sure knows how to write a story. Once again, this book is great for sci-fi lovers, fantasy enthusiasts, action seekers, and also romance fans.